to see the current Web cam images. Web cams on or near Long Beach Island. Shore House daycam. The primary Web cam at our house on Lee Avenue. Pan & tilt controls enabled. 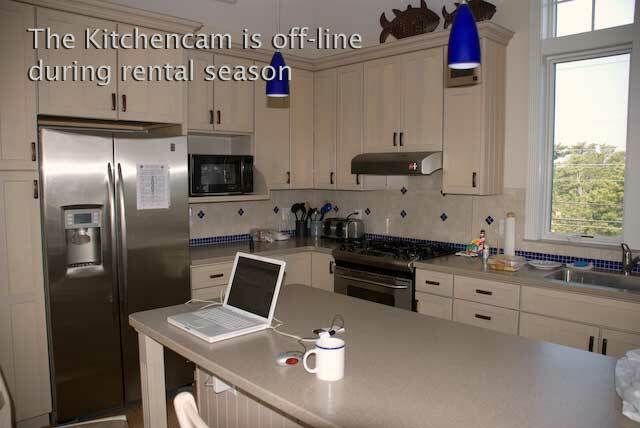 Shore House kitchencam. Our 2nd Web cam at the Lee Avenue house. Storm Haven Web Cam. The Web cam at a private weather site in Loveladies, just north of Harvey Cedars. Brant Beach (68th Street) Monitor. Normally EXCELLENT nearby Web cam and ocean data provided by the Coastal Monitoring Network of Stevens Institute. Repaired in October 2007. 7th Street Surf Cam. Surf shop in Ocean City keeps these two Web cams. Point Pleasant Surf Cam. Cam has been a reliable surf view. Belmar Surf Cam 2. Located at 16th Avenue in Belmar. Brave New World Surf Cam . Located somewhere near the Manasquan Inlet. Atlantic City Surf Cam. The Coastal Monitoring Network station in Atlantic City. Avalon Ocean Monitor. Another of the Coastal Monitoring Network stations, this one south of LBI, near Cape May. NJ Surfers' Cam. In Monmouth Beach. On during daylight hours only. Web cams below checked, but not updating. Ocean City. Located at 14th and Boardwalk in Ocean City.